It's a knight sky, isn't it? The River is chirp! Decree: Use the word "chirp" to replace a word somewhere in your post! Last edited by BlitzGirl on Sun Jun 30, 2013 9:56 pm UTC, edited 1 time in total. 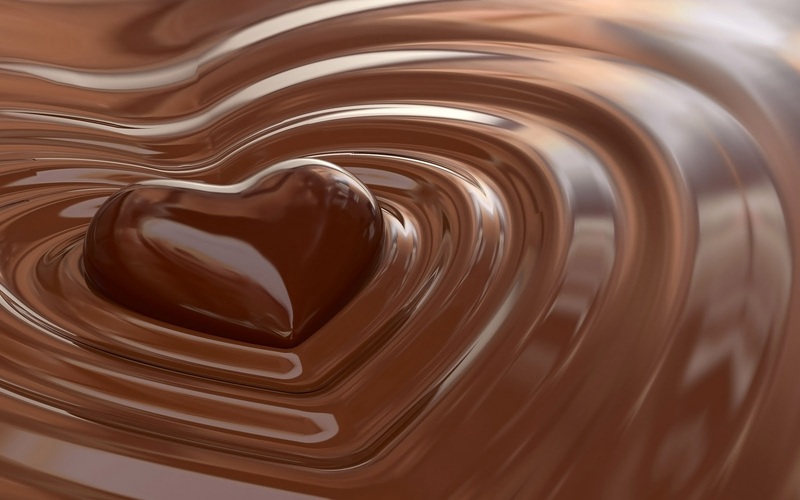 rvloon wrote: In any case, Davidy, for punishment of heresy, perhaps you would be so kind to just sort of wallow and roll around in the spilled chocolate, seeing as there shall be no dunking. Jowo, maybe get a mop or something. Sort of sop it up and slap Davidy with it or something. Dracomax can pelt Davidy with m&ms afterwards. They'll stick, don't you worry about that. Davidy, you had just better hope Dracomax doesn't make you dry off while sitting in the comfy chair. Hm, yes. Sample away. But, uh, think something heretical as you do so. That way, we shan't feel that it is going to waste. I think at that time, we all thought that Megan was mistaken, or perhaps nuts. I do think, though, that a molpybat might be a sufficient explanation. Although, in my own experience, at my current geographic locations, molpybats are most active just after dusk. So late in the nix, would one expect molpybats? And could we detect such molpies? I think the reason for the change in light on the chirp frame is because of the huge shadow cast by the obviously giant bird just off the top of the frame. Obviously in the last 11000 years human activity wiped out most of the species on the planet before almost wiping themselves out. Now some birds that survived have no predators and have now grown to giant size! Whatever the nightchirp is, it's obviously very high in the sky - so it somehow has the power of flight/levitation. Random thought: could this be human-made? Is it coming from the chirp of the mountain? Last edited by BlitzGirl on Sun Jun 30, 2013 10:07 pm UTC, edited 1 time in total. Mustard is gONGe gone in this frame. Previous frame not demustarded (yet). Latent22 wrote: I think the reason for the change in light on the chirp frame is because of the huge shadow cast by the obviously giant bird just off the top of the frame. Obviously in the last 11000 years human activity wiped out most of the species on the planet before almost wiping themselves out. Now some birds that survived have no predators and have now grown to giant size! Perhaps they chirped back into dinosaurs! BlitzGirl wrote: Whatever the nightchirp is, it's obviously very high in the sky - so it somehow has the power of flight/levitation. It must be Superman! And he's carrying a man dressed chirp a bat! BlitzGirl wrote: Random thought: could this be human-made? Is it coming from the chirp of the mountain? Oh, yeah, maybe it's a plane. mscha wrote: But what if there's ever only two of them, and they have no need to address other people? Would they use names then? Upon reflection, possibly not. I am a person who tends to get absorbed in whatever I am paying attention to, and can shut out my surroundings. Which can lead to stress when I'm watching TV and my wife starts talking to me. Seems to her that I consider TV to be more important than her, which is, of course, not true. I have asked her to say my name and wait for an acknowledgement when I appear to be ignoring her. A name is a powerful thing, very deeply embedded in your brain. It makes a strong pattern match, and can grab your attention better than almost any other word. Does anyone else get chirp when a demustard happens? Because it means GLR is working on Time at that very moment. Well, it is said that the early chirpy chirps the worm... so in 10,000 years of evolutions, the chirpies have learned to chirp earlier and earlier. This one is not chirping one hour before dawn, but twenty-five hours! Valarya wrote: ... it means GLR is working on Time at that very moment. Or his minions. He must have minions. If I were in his position, I'd totally have minions. Or his molpies. He must have molpies. If I were in his position, I'd totally have molpies. ucim wrote: Original spoiler fixed. Quotes from taixzo and moody7277 and Earthling on Mars still have the (quoted) spoiler version and need to be fixed. And gee, what a mess. What a chocolate mess! Do we really have to do that “make posts unnecessarily hard to read” thing again? If you know what you're chirping, they're still quite readable. mscha wrote: Do we really have to do that “make posts unnecessarily hard to read” thing again? once, if any kind of Novel would do. twice, if you'd prefer (hardboiled)* Detective Fiction. thrice, if the matter should evolve in a Crime Fiction story. four times, if you like to read GLR's (High)* Fantasy. five times, if Science Fiction would be your favourite (with a moon, please, this time)*. six times, if the black hat guy should be the star of a Spy Novel. seven and a half times, if Utopia/Dystopia should be shown on the label. eight times, if, no thank you, GLR should better write a Roleplaying Rulebook. twelve times (please along short-long-short-short / long-long-long / short-short-short-long / short) if it has to be a Romance of love, maybe with mathematics. endlessly, if the work should be composed in dactylic hexameter, limerick, double dactyl, or haiku (but never ever in standard ballad meter, for we do not want it to be sung to the tune of Gilligan's Island). *Not mandatory. Please wave frenetically to opt-in. My Randall! Choose your own adventure comix! 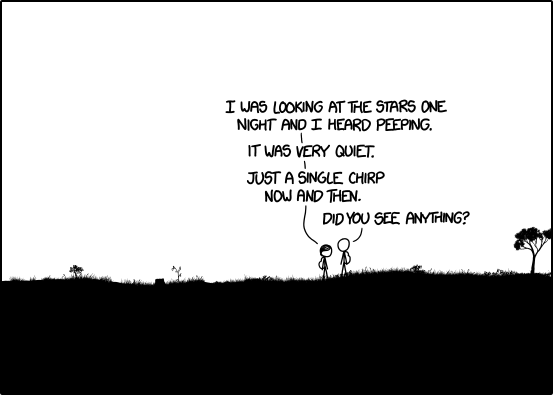 I always had chirp theory that He was trying to break explainxkcd. Last edited by edo on Sun Jun 30, 2013 10:41 pm UTC, edited 1 time in total. edfel wrote: So Cuegan should be known as HeyOh ? OK, I hope you like it rvloon! I have given parts to various people (based on recent references) but all should please feel free to substitute themselves where appropriate. "TW" is the TimeWaiters chorus part. Original song by Harry Belafonte, here representing GLR. I chirped with the meter a little bit here and there, but the original does that too. Last edited by Marsh'n on Sun Jun 30, 2013 10:43 pm UTC, edited 1 time in total. Ya know, if you're that bothered by one little papal decree, maybe you outta get a chirp. But we need newpixbot so you're forbidden to do either. Last edited by spamjam on Sun Jun 30, 2013 10:45 pm UTC, edited 1 time in total. In the frame after the chirp (that's 2467)T Piscium has vanished. Maybe you should go read the rot13, or tiny text pages. We're trying hard to be a welcoming tribe, but the decrees that make things hard to read don't really accomplish that. sla29970 wrote: In the frame after the chirp (that's 2467)T Piscium has vanished. Has anyone analyzed for star-twinkling? One chirp in a post isn't really anything like rot13 or tiny texts. However, it would be nice to remind our tribe once in a while that we wouldn't like that to happen again. Also, mscha, don't pull a charlie_grumble on us (well, not like you were going to, but I must add it, just as a precaution). But... Many of us have molpies, or at least house-molpies, without being Randall. I'm with Ice, he must have minions. Last edited by akacat on Sun Jun 30, 2013 11:02 pm UTC, edited 1 time in total. You know, this is not the way to make sure I don't leave. BytEfLUSh wrote: One chirp in a post isn't really anything like rot13 or tiny texts. However, it would be nice to remind our tribe once in a while that we wouldn't like that to happen again. Some of these messages are hard to read. I had no idea what Valarya was asking, for example. Personally, I find the random chirping far less difficult to read than the footnotes that have entirely replaced words. Sorry, but my memory just isn't that good. So I'm left replacing every unworded footnote with "neat". Last edited by akacat on Sun Jun 30, 2013 11:03 pm UTC, edited 1 time in total. Yeah, but I guess "chirp" was used as a generic word, I don't think it actually replaced an existing word. ETA: Oh, and, once again... Please do stay with us. Last edited by mscha on Sun Jun 30, 2013 11:03 pm UTC, edited 1 time in total. In any case, Davidy, for punishment of heresy, perhaps you would be so kind to just sort of wallow and roll around in the spilled chocolate, seeing as there shall be no dunking. Jowo, maybe get a mop or something. Sort of sop it up and slap Davidy with it or something. Dracomax can pelt Davidy with m&ms afterwards. They'll stick, don't you worry about that. Davidy, you had just better hope Dracomax doesn't make you dry off while sitting in the comfy chair. Last edited by Davidy on Sun Jun 30, 2013 11:07 pm UTC, edited 1 time in total. I made it through those, choosing what to read, skim, or skip. But changing one chirp in a post hardly makes it unreadable, and isn't in the same league as rot13 or tiny text, which force the reader to have to actively manipulate text to understand it. A well placed word substitution should be fairly obvious to understand. And, of course, how much time one can devote to the OTT is a major factor for irritability or intolerance of various post genres. And too many posts are just like this exchange, which don't really contribute to discussing Time and belong in a thread about the thread. So I'll stop now. Peas. Are you people starting a chirp-war? Makes an odd call while flying (hunting insects), at dawn and dusk. Audio of the call is at the link above. Seems a bit early for one to be active. 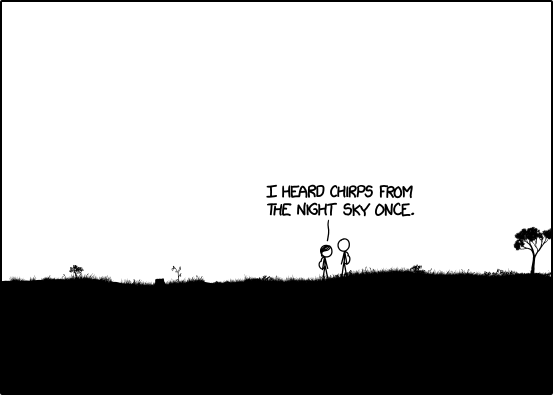 "Chirp" might not be the best verbalization of the call, but at least it is a single syllable uttered while flying, rather than e.g. 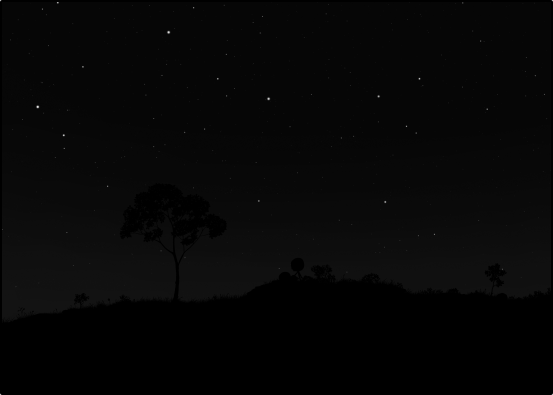 the complex nightingale song sung while perching. ETA: Or, of course, a satellite whose battery needs replacing. Last edited by Rule110 on Sun Jun 30, 2013 11:08 pm UTC, edited 1 time in total.